The HYL materials consist of 6 levels for a total of 3 to 4 years of English. Each level covers six months of leaning and playing fun for the children, the teachers and the whole family. 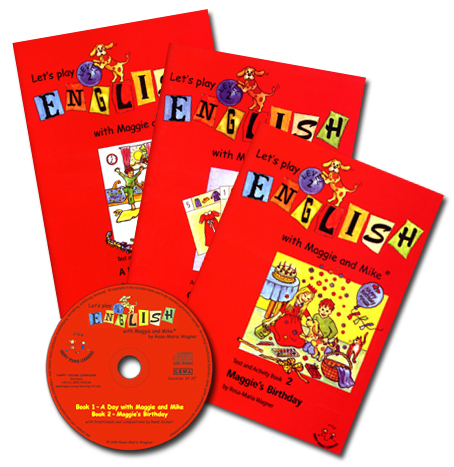 Maggie and Mike are sister and brother from England 4 and 7 years old and they gently introduce beginners to the English language with many funny stories taken from everyday life. Your children will soon make friends with them. Just listen + sing + play along! You will receive all the dialogues, stories, rhymes and songs and numerous exercises to apply what the children have learnt in many different ways. They offer many new opportunities to speak and also support children in many skills such as concentration, memory training, logical thinking, creativity, combination skills, fine motor skills and sound perception. For preschool children they are additionally an excellent preparation before starting school. In Levels 5+6 they gentle introduce children to reading and writing, and this also leads to a great sense of achievement. All Activity Books contain exercises on sound perception (sound analysis) - this is the basis for reading and writing later. The picture cards comprise subject, object, adjective and verb cards to make sentences in a creative way. 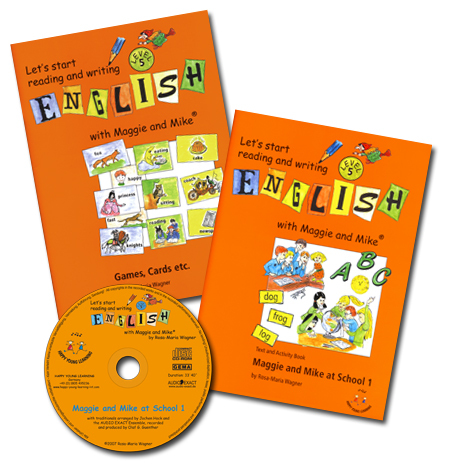 This encourages children to make sentences in the correct English sentence structure and even to "invent" funny and imaginative sentences. Suitable for group and one-on-one work and for the child to reinforce and use at home. The games are fun for the whole family to learn and play with. 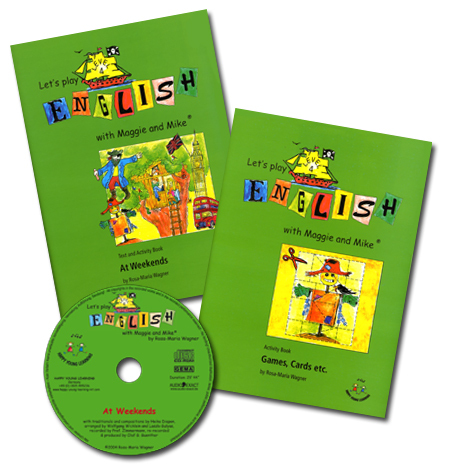 Just play "English" with your child! Duration: 30 to 45 minutes You receive all the dialogues, stories, rhymes and songs (traditional and new). They are the basis for learning English with HappyYoungLearning. The CD-ROMs are spoken and sung by native speakers. 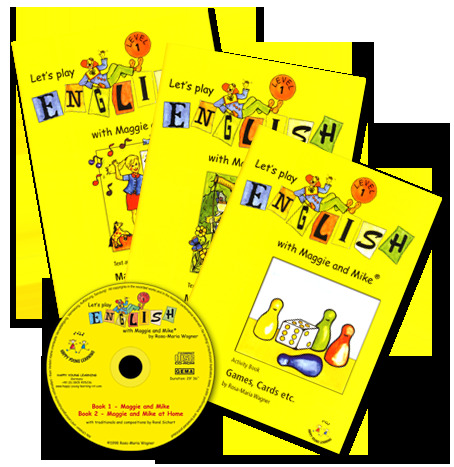 Your child will be immersed in the English language (immersion method) and will internalise what he hears by listening many times to the CD. Allow your child to listen to the CD at least once a day - they need no effort, no concentration - you can even sing along! 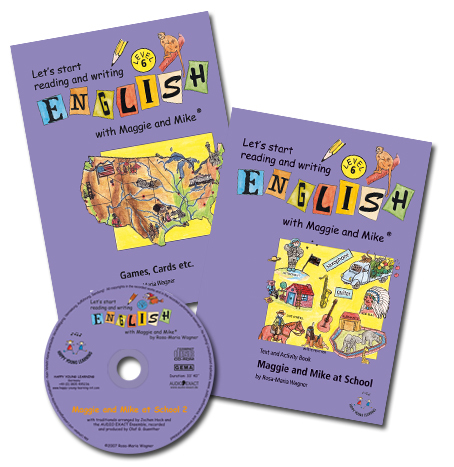 For 3 to 6 year olds With content from Level 1 "Maggie and Mike“. 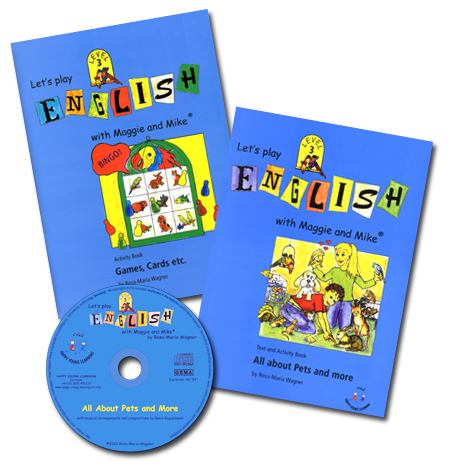 Easy introduction to the English language with pictures, animation, games and songs. Based on sound pedagogical theory, your child's progress is child's play and they concentrate on what is most important. Have fun on your computer! or even teach English themselves. A valuable contribution to your child's holistic education!